We’ve already had snow in this part of Canada, so in my brain it is already winter. I hope, however, that wherever you are, you are all enjoying your autumn. The other members of Figure 3 Illustrations agreed that the desire was present to do another con this year, despite how hard the year has been on all of us. 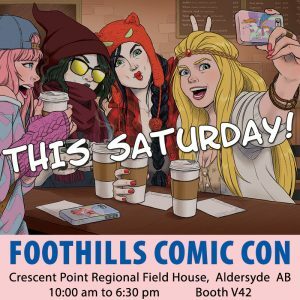 So we’ll be at the southern Alberta show Foothills Comic Con, which aside from being fairly close also benefits the Foothills Fetal Alcohol Society. Hopefully some of you can make it out to support the event. My migraines just get less and less predictable, their increased frequency indicating that I’m still missing some pieces in my pursuit of better health. So under the guidance of a professional (I’m all about safety), I’ve moved on to other lifestyle changes that require a lot of time and focus… and rest. Time will tell if they work for me, and in the meantime I’m doing my best to fulfill previous agreements made with the ultra cool people in the indie comic community. It is going much slower than I’d like, and slower than they deserve, but it is moving along! That means Stray Sod must continue to wait, for now, but the groundwork is being laid so that when I return to it, the comic and my physical and mental health will be much more sustainable.